It’s niggled at me slightly that, despite the name of this blog, only one of my posts so far has focused on cycling, even though it tends to be my main source of exercise. That’s probably because most of my cycles these days take place relatively close to home. This weekend I ventured a little bit further, deep(ish) into neighbouring County Armagh. Some days I’ll improvise my route as I go along while other times I’ll have a certain location or viewpoint in mind when I set off. For Sunday’s cycle I was drawn to revisit a striking landmark I first came across back in 2011: a towering obelisk on a hilltop between Loughgall and Richhill. My looped route took me through some pleasantly undulating Armagh countryside, with the added colour of Apple blossom season. My outward journey was via Ardress and Loughgall village while I returned by a slightly more westerly route via Tullyroan and Clonmore. Here are some of the sights along the way. A glimpse of the National Trust property Ardress House, and its outbuildings. I did the house tour a couple of years ago and it’s very enjoyable, as is seeing the chickens and other farm animals. Loughgall is a small but gorgeous village with many interesting buildings, and I always enjoy cycling through it. Its large country park is well used, with facilities including a golf course and a walk around the shore of Lough Gall, which gives the village its name. I remember cycling to Loughgall in May 2014 to see the village decked out in pink for the visit of the Giro D’Italia Big Start cycle race; the third and final day began in nearby Armagh City with a finish in Dublin. My parents and myself went to see the competitors on the day at Red Lion crossroads to the east of Loughgall. It was a great vantage point as we saw the pelaton climbing a hill before making a right turn. I’d been involved in promoting the event as part of my old job so it was fantastic to experience the atmosphere up close with lots of other spectators. It’s thought that a church has existed here since about 1300 and that local Protestants were imprisoned in the building during the 1641 Rebellion. The church was in use until at least 1795 when work began on the village’s current Church of Ireland, St. Luke’s. Another view of the church ruins; they’re a striking sight in the centre of the village. The graveyard is accessed through an archway visible here. From Loughgall, I took the hilly main road to Richhill (Drumilly Road) then took the first right (still called Drumilly Road), where my target soon loomed large atop the rounded Cannon Hill. This refers to the winning of legislative independence for the Irish Parliament in that year. Pressure from the Irish Volunteers, an association of locally raised militias from around the country, and political campaigning by Irish MP Henry Grattan, persuaded the British Government to make concessions. This independence proved largely cosmetic, however, and was short-lived: the Act of Union of 1800 would abolish the Irish Parliament altogether, following the failed 1798 Rebellion led by the United Irishmen. The prominent Molyneaux family, who had long been supporters of the campaign, lived at Castle Dillon House overlooking the lake of the same name, a short distance to the south of the obelisk. I’ve yet to see the house (the original building dates to the early 17th century and the current one to 1845) but apparently it is in a poor state. It was used as a retirement home and even by the British Army in recent decades. This old blog focuses on the house, with some old exterior images and more recent interior ones. The hill and obelisk can be reached from the narrow Drumnasoo Road. It was lovely up there in the evening light and the views are extensive, with the Sperrin Mountains to the northwest and the twin spires of Armagh’s Catholic Cathedral to the southwest. I have a photo from my first visit where you can make out Slemish in County Antrim. Next to the obelisk is a trig pillar marking the hill’s 78m height. They’re always a special find, especially a relatively lowly one like this. There’s also the remains of an interpretation panel, but the text is now completely gone (seen here in better days). After spending about five minutes on the hilltop, I made my way down and sped off on the bike to make sure I got home before dark. Overall this was my most enjoyable and longest cycle for a while. 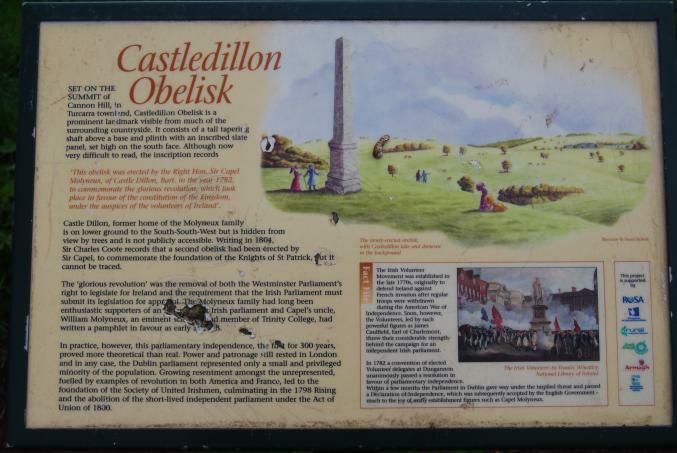 I’d like to return to the area some time for a look at Castle Dillon House and to get some distance shots of the obelisk. A lovely relaxing read. It’s been ages since I was in Loughgall and my hometown of Armagh. Thanks Ashley, it’s a great corner of the world. Some lovely countryside around that area. That’s quite the cycle! To think I have an aim of getting 20 miles in one day by July! The views are amazing, I love the picture of St. Patrick’s Catholic Cathedral at the top of the page, you could easily imagine a similar view on the day the Cathedral was completed. One day soon I shall have to explore all these areas you are going to. Thanks James, yes we’ll have to get you over again to see more of these parts. I’m sure you’ll get to 20 miles handy enough, it’s a fair distance but manageable, especially with stops. Someone else said the same thing about the Cathedral shot and I hadn’t even thought of it like that. There’s a timelessness to that view. Fascinating post Martin. I’d never heard of this obelisk, and its got a very interesting story behind it. I wouldn’t be very familiar with that area, but its on my list of places to go now! Would particularly like to go up to the obelisk. Cheers Aidy. Don’t think many people outside the area know about it, I remember seeing it marked on the OS map and took a drive down to investigate. Definitely worth a look if you’re ever nearby, especially on a clear day for the views. It’s a shame landowners don’t build obelisks anymore! Nicely written as usual. An area I know relatively little about. I think the only time I’m aware of Loughgall is when driving past the Junction on the motorway. Thanks Canice. It’s quite a pretty and distinctive area. That’s the heart of orchard country.